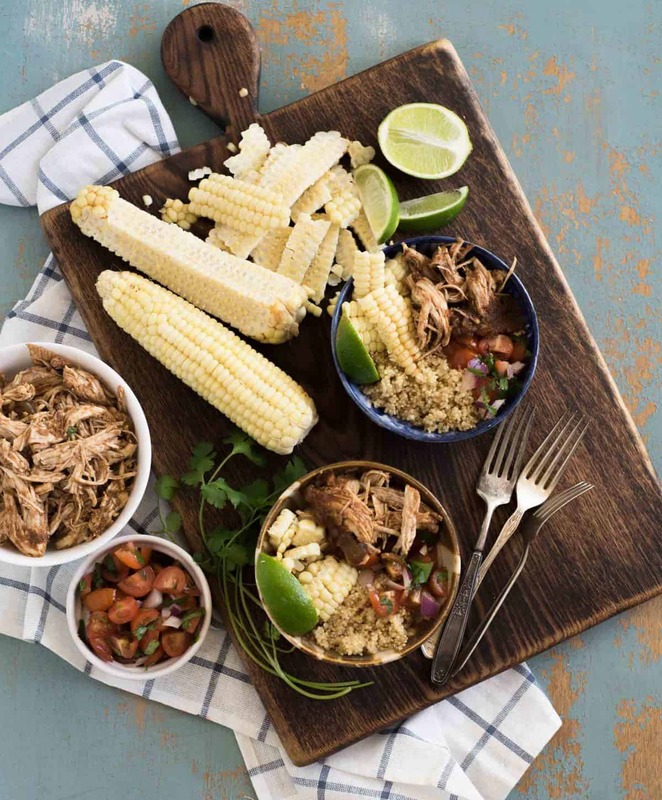 Chipotle Chicken Burrito Bowls are a quick and easy dinner idea that the whole family will love because everyone can build their own bowl, just how they like it. 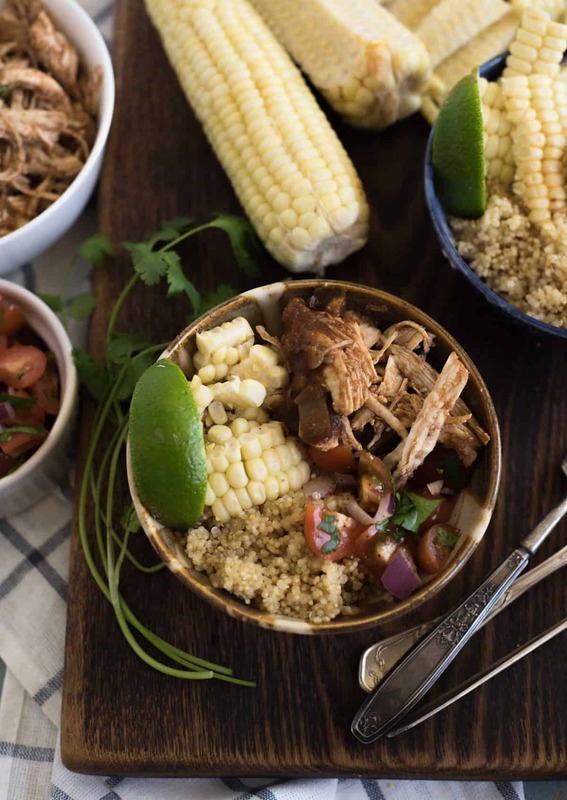 Have you gotten into the burrito bowl trend yet? It’s one of my favorites because everyone can pile on what they like and how much of it they like. The chipotle chicken comes out so tender and so full of flavor too. The best part is that you can make it in the Instant Pot OR the slow cooker which means I think just about all of you can make it today. You only use a few tablespoons of chipotle sauce but it adds so much flavor! I found the sauce in a can at my little store and it came in medium heat. If you don’t like it too hot, add one tablespoon; if you like it really hot, add up to 6 tablespoons. Did you know that chipotle peppers are just smoked and dried jalapeños? That’s a good way to gauge the heat – one tablespoon is about like using one jalapeno pepper in my experience. There’s so much added flavor, though, because the peppers are smoked. I love using this chipotle sauce in recipes like this because with a base of something simple like rice, it adds a lot of flavor to the whole dish and not just the meat that is cooked in it. 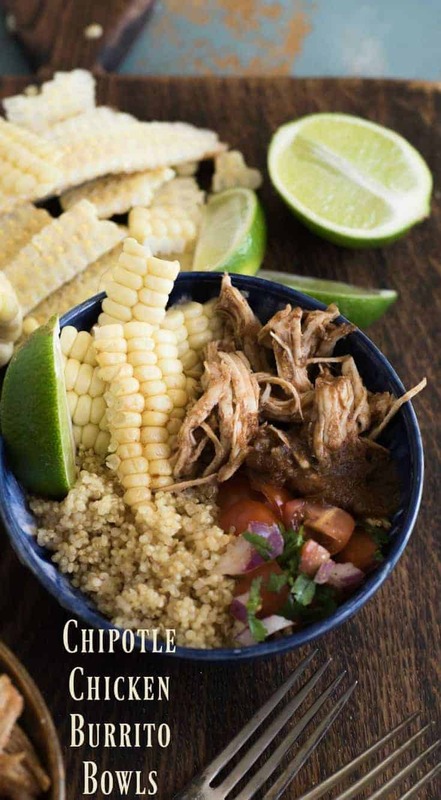 I love adding fresh corn on the cob, removed from the cob, to burrito bowls. It adds a great sweet crunch! The recipe indicates making this in an Instant Pot, but you can make this in the slow cooker by combining all the ingredients together and letting them cook on low for 5-6 hours until the chicken is tender and ready to be shredded. Both work great – use what you have! 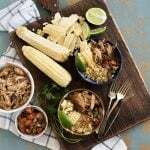 If you are cooking your chicken in the slow cooker, just cook your corn however you normally do (boil, grill, whatever is your favorite). I prefer to use boneless skinless chicken thighs for this recipe, because I think they stay more tender and moist. It did work great with chicken breast too, though, so use what you have on hand. Add whatever taco toppings you like! We love this with beans, cheese, avocado or guacamole, shredded lettuce, black olives, etc. 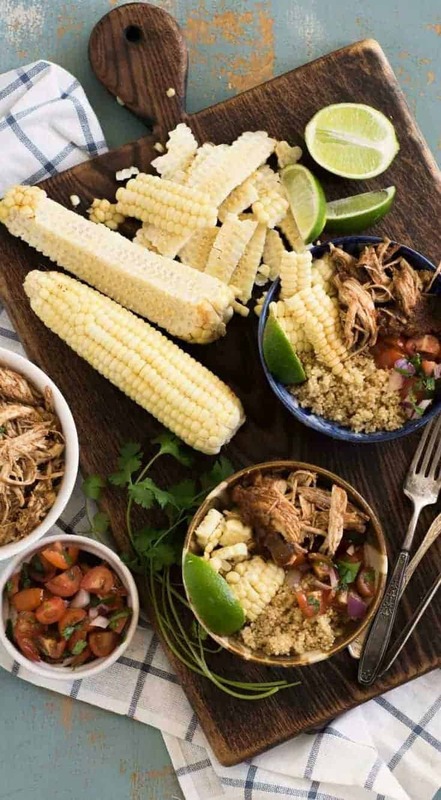 Chipotle Chicken Burritos Bowls are a quick and easy dinner idea that the whole family will love because everyone can build their own bowl, just how they like it. Lock the lid in place, make sure the vent is set to seal, and select high pressure and 12 minute cook time. Add the corn on top of the chicken and then close the lid again, select pressure cook and a 2 minute cook time. Use tongs to remove the corn and set aside. Remove the chicken and place in a shallow dish or bowl and shred it. 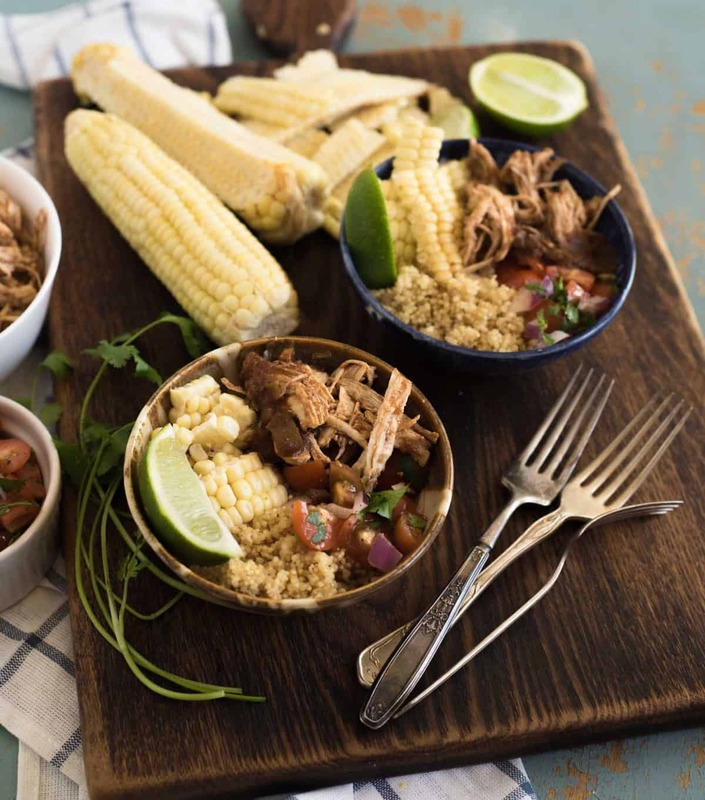 Serve the chicken over the cooked rice or quinoa and top it with corn sliced from the cob, salsa, and a squeeze of fresh lime. All of these would be great in your burrito bowl. Enjoy this super easy and fun dinner from my kitchen to yours.